"God of power and mercy, you blessed the Americas at Tepeyac with the presence of the Virgin Mary of Guadalupe. May her prayers help all men and women to accept each other as brothers and sisters. Through your justice present in our hearts may your peace reign in the world. "We ask this through our Lord Jesus Christ, your Son, who lives and reigns with you and the Holy Spirit, one God, for ever and ever. Amen." For a quick overview on Our Lady of Guadalupe, see The Story of Our Lady of Guadalupe, helpfully provided by the ever-awesome Franciscan Friars of the Renewal (who have placed themselves under the protection and guidance of Our Lady of Guadalupe, btw). 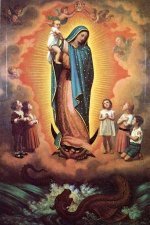 The splendid and wonderful Franciscan Friars of the Immaculate have posted this great homily on Our Lady of Guadalupe and her patronage of the pro-life movement. And for All Things Guadalupe, check out Our Lady of Guadalupe, which provides extensive information about Our Lady of Guadalupe along with other aspects of Marian devotion. I especially like the picture gallery; there's an awesome St. Michael statue shown there! Seriously, anyone know how we can order a (small) replica of that sucker?! Wow, I LOVE that St. Michael statue! I hope there is a smaller version!